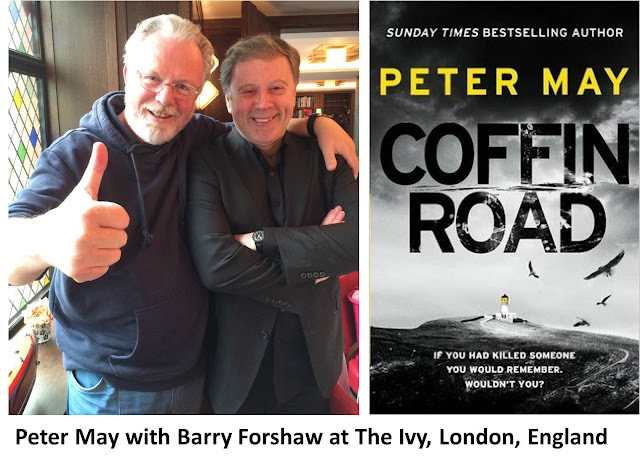 A new novel from award-winning crime writer Peter May is an event, and his latest COFFIN ROAD which is released Thursday 14th January, is no exception. Hot on the heels of last year’s deeply personal Runaway, and the exploration of the infamous Scottish Clearances, Entry Island, Coffin Road returns us to the Scottish Islands, immortalised in Peter’s award-winning Black House trilogy. 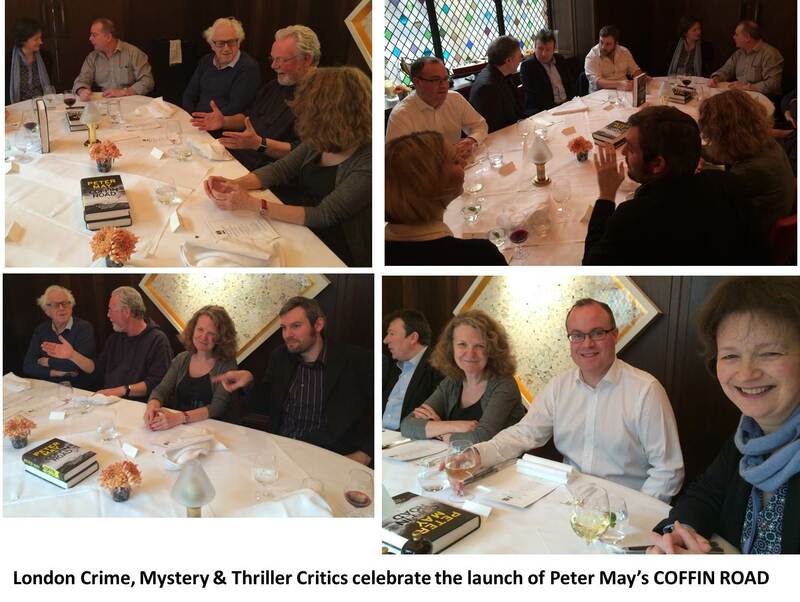 So with thanks to Quercus Publishing’s Jon Riley, Hannah Robinson and liaison Sophie Ransom, a group of London based Literary critics were invited to join Peter May for lunch at London’s The Ivy, before Coffin Road is released on Thursday 14th January. Shots Editor Michael Stotter and I, had a most delightful afternoon, meeting up with our friends and colleagues, including Barry Forshaw, The Telegraph’s Jake Kerridge, The Sunday Times’ Joan Smith, Jon Coates of The Sunday Express, Joe Haddow from BBC Radio 2 Bookclub and Marcel Berlins of The Times. It was especially delightful to see Marcel in rude health as he had been seriously ill, but he had recovered and was in great form, and as energetic as ever. As I had stepped down after three years as a CWA Goldsboro Gold Dagger Judge, I had been asked to join the CWA Steel Dagger Team as a Judge. 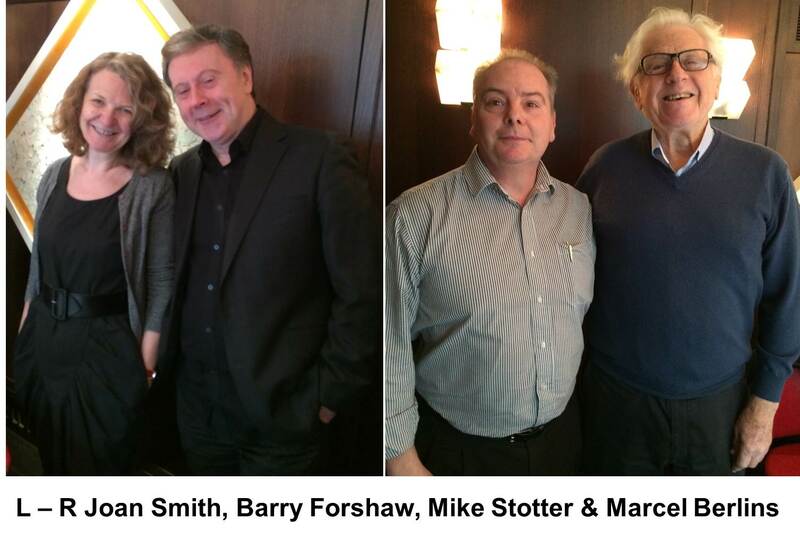 Marcel had to step down from the CWA Ian Fleming Steel Dagger judging committee managed by Ian Fleming Publications, due to his recent illness. We were all delighted that he was looking so well, as Marcel is a very dear friend of ours, and a great writer, reviewer of the genre. Jon Riley and I chatted about Peter’s new work Coffin Road. Both of us remarked how we liked the style, reminiscent of John Le Carre’s The Constant Gardner in so far as it was a deeply gripping thriller, striated with a conspiratorial edge [and social conscience] which is hinted at by Peter’s dedication “To the Bees” which should give readers a clue as to a hidden theme. 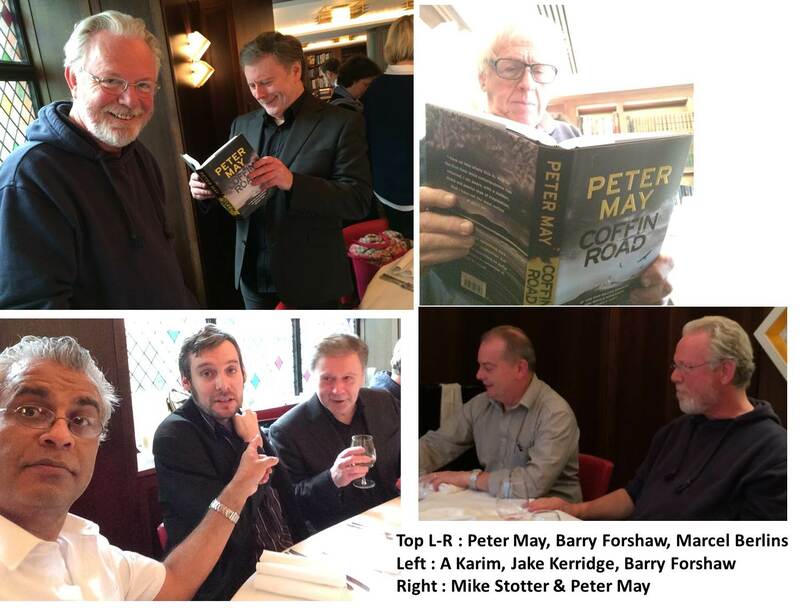 So after a few drinks and lively conversation, followed by an excellent lunch, Jon Riley introduced Peter May who said a few words, including a surreal and humorously mischievous observation on his publishing career. We all knew Peter was previously published by Hodder and Stoughton, but had parted ways several years ago and had been picked up by Quercus Publishing, with The Black House; and Quercus Publishing were now owned by Hodder and Stoughton; proving the circular and surreal nature of life and the continued consolidation in the publishing industry. We present a smattering of photos from the literary lunch hosted by Quercus at The Ivy on Wednesday 13th January, a day before release of COFFIN ROAD. Peter starts an extensive tour in support of his new work, and we’d urge you to attend as not only is Peter May a remarkable crime writer, but he is a very amusing raconteur as his speech above, indicates. Read the Shots Review here and Shots have hardcover copies at a generous discount for our readers here because if you enjoyed The Black House which commences The Lewis Trilogy, you’ll relish Coffin Road. Shots Ezine pass thanks to Quercus Publishing for a wonderful lunch and afternoon, a respite from our busy lives and a chance to break bread with Peter May, a tremendous writer who is enjoying critical and commercial success with his exceptional narrative skill. Michael Connelly on Season 2 of "Bosch"